The Soviet government often exaggerated tales of its front-line snipers for propaganda purposes. The sniper duel between famed Soviet sniper Vasily Zaitsev and “Major Konig” was probably myth, although Zaitsev was unquestionably a remarkable soldier. Such myths are a weapon in a fight for national survival, and a tool for building morale. But in terms of history, the myths complicate the picture. However, the Soviet Union certainly embraced the sniper, perhaps more than any other combatant during World War II, fielding them in larger numbers and on a wider scale earlier in the conflict than Nazi Germany. The Mosin-Nagant rifle modified for long-distance work was the Red Army’s primary sniper weapon. The Soviet soldier in World War II commonly carried the unscoped Mosin-Nagant M91/30 — a weighty, nearly indestructible bolt-action battle rifle capable of carrying five 7.62x54R rounds, shared today by the Dragunov sniper rifle and PKM machine gun. The powerful cartridge and simple construction means the Mosin kicks like a mule, but provides accurate and reliable firepower in a weapon that is easy to maintain and hard to damage … too much. And most importantly, it was easy to produce in vast numbers. A Mosin without a scope — relying on the rifle’s iron sights — has an effective aimed fire range up to around 500 meters, adding to or subtracting from the number given the individual rifle’s condition and the shooter’s skill. A well-trained and sharp-eyed shooter can conceivably hit a human-sized target at longer distances, but it’s not easy. Following prototype attempts in the 1920s, the Soviet military began adding a variety of scopes to Mosin-Nagant rifles in 1932, eventually settling on the 3.5-power “PU sniper” variant in 1942. Another version with a longer four-power scope, the PEM, was less common. By 1942, as the German army renewed its offensive into the Russian heartland, the USSR was producing 53,000 PU sniper rifles annually, according to Martin Pegler and Ramiro Bujeiro’s illustrated book The Military Sniper Since 1914. That’s a stunning number. The Soviet military high command also handed out millions of sharpshooter badges, most likely in a looser fashion than comparable armies at the time, but it did reflect a commitment to the sharpshooter craft in a way that struck fear into the German military. Pegler and Bujeiro note that during one ambush in September 1941, Soviet snipers killed at least 75 German soldiers of the 465th Infantry Regiment before disappearing into the woods. Like the standard Mosin-Nagant, which is one of the most heavily-produced rifles ever, the PU sniper proliferated worldwide following the end of World War II. But because they were less common than the millions of unscoped Mosins the USSR would produce, a genuine PU sniper today can fetch $1,000 or more on the civilian market. A standard Mosin is considerably less expensive. But the high price is mainly a problem for collectors. 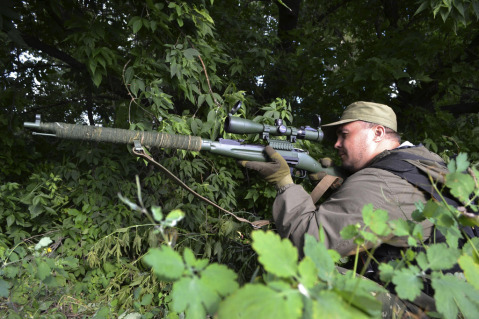 A modern-day sniper with a Mosin-Nagant whether in Ukraine or Syria can find other ways to add a scope. Photographs from the wars show a wide variety of creative scopes, some in the “scout” configuration featuring a long eye-relief scope mounted forward of the bolt, as the Mosin’s standard “unbent” bolt will interfere with a scope mounted farther back. The PU sniper features a bent bolt handle, allowing for the closer eye relief, but to replicate this with a standard Mosin requires making several unalterable modifications which — if done by a hired gunsmith — could cost as much as the rifle itself. Historical collectors tend to frown on these kinds of permanent changes due to the required drilling into the receiver and cutting of the bolt handle. 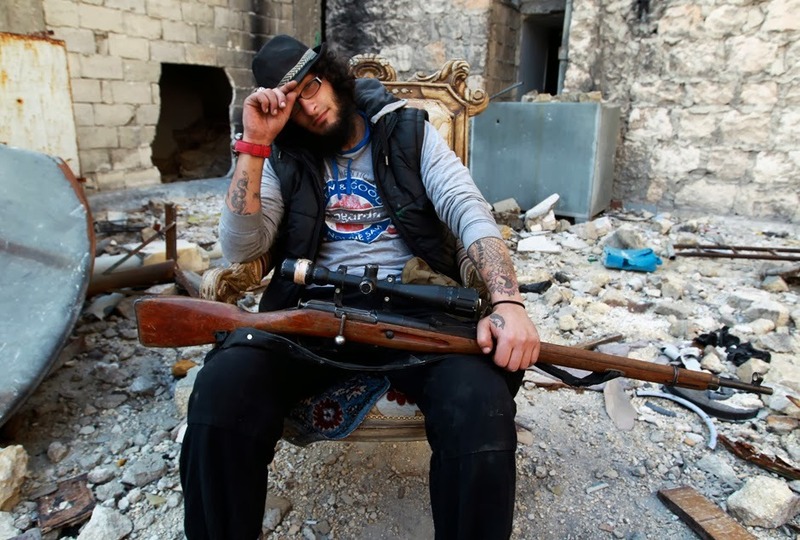 But for snipers fighting very real wars in the 21st century with early-20th century rifles, keeping a weapon historically authentic falls down the list of priorities compared to whether it’s effective on the battlefield.